You ride a bike, but do you know HOW to ride a bike? The reality is, most of us rode bikes as children. We didn’t really know how, but we didn’t need to know. We just did it. It was easy. It was intuitive. We didn’t have to think about it. But as adults, we have an overwhelming need to understand the why and how of riding a bike. We want to fix, manage, and control things. But most of us don’t really understand how and why a bike works. We just do it. And that’s okay, until the day we make a mistake, because we don’t really know how to ride. No one can help you ride or race your bike better than the coaches of Savvy Bike. Since 2002, we’ve helped 1,000s of women and men achieve their goals of being smarter, safer, more skilled, and more confident on the bike. We’ve created a learning atmosphere where you’ll feel comfortable and safe, and yet challenged to try something new. Everyone can benefit from our skills clinics, whether you’ve been riding six months or two decades! We take the hit or miss out of the learning process to help you flatten the learning curve. It doesn’t need to be difficult or painful to learn to ride or race a bike. We’ll help you ride “with” your bike instead of “on” your bike. And we’ll help you have fun! By popular demand, we introduced our Bike Skills modules in 2008. We took our most popular two-day bike skills clinics and broke them down into 4-hour modules so you can focus on those skills that are most important to you. 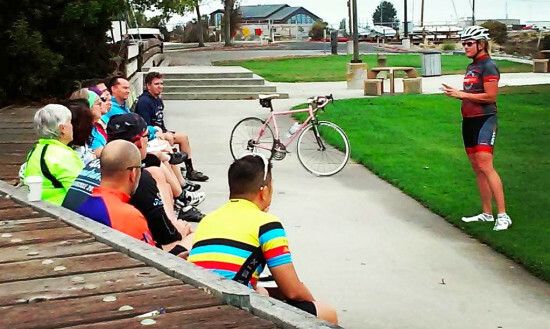 In addition to our Bike Skills clinics, we’ve got our popular 2-day Bike Touring 101 trip to Pigeon Point, a new 2-day Bike Touring 201 trip to Pt. Reyes, and four different 3-day camps (including some new women’s camps). Please note that Bike Skills 101 is the pre-requisite for our more advanced road cycling clinics. Whether you’d like to learn to commute or your routes take you on city streets, this clinic is a must-do for anyone who would like to improve their urban riding. This 4-hour co-ed clinic focuses on how to navigate the road with safe and defensive riding techniques. You’ll learn how to prepare your bike for urban riding, the law regarding bicycles, on-bike skills to keep you safe, and how to “drive your bike” to optimize your ability to co-exist with other road users. This clinic includes classroom and on-bike activities, including a short urban ride where you’ll practice navigating different types of road scenarios. This 4-hour co-ed clinic is the foundation of everything else you’ll learn on the bike. This is the clinic where we teach the old dogs new tricks and the newbies the fundamentals. You’ll learn about balance and weight distribution and how that affects your ability to ride your bike safely and confidently. We’ll learn skills like riding with no hands, emergency stops, and how to look behind you while holding your line, how to steer, and counter-steer. After just four hours, we guarantee you’ll be a better bike handler and have much more fun on the bike. This clinic is a pre-requisite for all other Bike Skills road cycling clinics. It’s time for a little dirty fun! We’ll teach you the basics (and not-so-basics) of balance, weight distribution, and how to use the terrain to your advantage. Learn to rock, roll, hop, and jump. Master the art of steep climbs. Learn to descend with confidence and skill. After just four hours, we guarantee you’ll be a better bike handler and have much more fun on the bike. Have you been wondering what’s all the buzz about cyclocross? It’s a fun but challenging sport that’s beginner-friendly and appropriate for the entire family. And best of all, it’s happening at a park near you! In this four-hour clinic, you’ll learn all the skills needed to get started in this incredible sport, including mounts, dismounts, and how to shoulder and carry your bike. We’ll also share information about bikes & equipment, the local cyclocross racing scene, and how to train for a successful season. We’ll finish off the day with a simulated race and de-brief. You’ll need a mountain bike or a cyclocross bike for this clinic. Curious about gravel grinding? Join us for Intro to Gravel Riding. We’ll cover the fundamentals of riding off the beaten path and adventure planning. This 8-hour clinic includes a two-hour pre-meeting on Thursday, January 31st to help you prepare for the weekend, covering the gear and the tools needed for fun and safe riding (bike and tire selection, clothing, etc). On Sunday, we focus on the fundamental skills of riding on dirt and mixed terrain, riding over obstacles, braking, cornering, and general bike handling. After lunch (included) we’ll finish the day with a group ride on our beautiful trails, giving you the opportunity to practice and receive feedback on the skills we learned in the morning. Bike Skills 201 is a continuation of what you’ve learned in Bike Skills 101. What goes up must come down, right? In this 4-hour co-ed clinic, we’ll teach you how to climb like a pro – seated climbs, standing climbs, short climbs, steep climbs, extended climbs. And then, we’ll teach you how to come back down again, focusing on a fast straight descent, and then a technical switchbacky descent. Pre-requisite: Bike Skills 101. Wheelsucking is an art! Whether you’re a racer or a recreational rider, group riding skills will help you ride longer, faster, and farther. We’ll learn draft theory and basic pacelines, beginning with partner work and progressing to more complex group riding skills and introductory racing techniques. Pre-requisite: Bike Skills 101. This six-hour clinic will teach you all the individual bike-handling and group riding skills you’ll need to race your first (or your 10th) criterium or road race. In addition to skills & drills, you’ll receive expert coaching on race preparation and logistics, and an introduction to tactics. We’ll finish the day with a training race followed by a de-brief. Pre-requisite: Bike Skills 101 or equivalent experience. Are you an experienced racer? Are you ready to step up your game for 2015? In this six-hour clinic we’ll focus on individual bike-handling, group riding, and racing skills. In addition to skills & drills, you’ll receive expert coaching on race preparation and logistics, as well as tactics (both individual and team). We’ll finish the day with a training race followed by a de-brief. Register with teammates to enhance your learning! Pre-requisite: Bike Skills 101 or equivalent skills clinic, or a minimum of 10 race starts. Similar to our Bike Touring 101 trip, Bike Touring 201 is a great way to learn how to tour by bike, with a bit more challenging route. This clinic includes a two-hour seminar on the topics of equipment, bicycle choice, what to bring, how to pack, camping, cooking, safety, and choosing your route. Then, we head out for a weekend of semi-loaded touring with a 50-mile moderately hilly route, starting in San Francisco and ending at Pt. Reyes Hostel, where we’ll have dinner, spend the evening, and sleep. The next day, we’ll have breakfast, pack up and return to San Francisco. This is a fully-supported event and includes ride nutrition, dinner (Saturday) and breakfast (Sunday), SAG, and your accommodations at the hostel. Are you planning to ride the Cinderella Classic on March 30th, 2019? If so, join us for this 10-week series of progressive training rides. The series starts with a 6-hour skills clinic, combining the best skills from our Bike Skills modules, along with important information about nutrition and bike maintenance, to start you off in the right direction for a successful event.